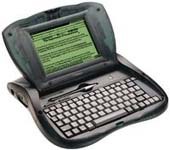 Introduced in March 1997, the eMate 300 was designed specifically for the education market. It was the first (and only) Newton-based machine with a keyboard, though a stylus was available as well. The eMate 300, though not particularly successful, represents Apple's first use of the translucent colored plastics that would become all hallmark of Apple's industrial design for the next few years. 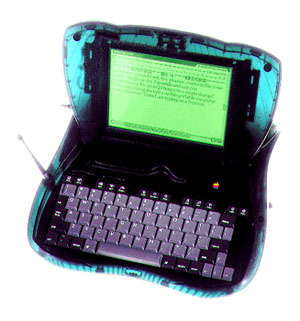 It shipped in a translucent aquamarine and black "clamshell" case, similar in some ways to the subsequent first-generation iBooks. For much more about the eMate 300, and all Newton devices, check out the Newton Gallery.